Aiming to bridge the gap between young and old through music, a choir consisting of over 200 young and older South Australians performed a medley of songs from a variety of genres in Adelaide recently. The repertoire included an Elvis medley, a version of ‘Que Sera Sera’ and ‘Jai Ho’ (the theme from the movie Slumdog Millionaire) as well as songs from the South Australian Primary Schools’ Festival of Music. ACH Group Dementia Learning and Development Unit Senior Manager Lenore de la Perrelle says the aim of the concert was to develop intergenerational links between the choirs and schools through a combined interest in singing and performing. 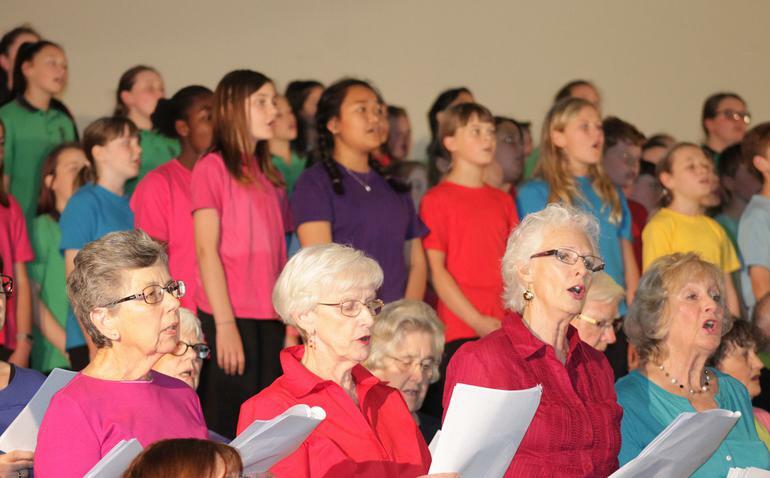 The choir was made up of more than 130 primary school students from St Leonards, Ridgehaven and Redwood Park Primary Schools, and 120 older people from the ACH Group Sing for Joy choirs at Seaford, Glenelg, Payneham and Wynn Vale. They were also joined by the Italian Chorale led by opera singer Teresa La Rocca and pianist Emma Knights. The Musical Director was Carol Young and legendary South Australian Vaudeville performer and personality Phyllis Skinner, 94, MC’d the concert. Her mother Bron Gaunt had watched students perform as part of the Festival of Music earlier this year and enjoyed seeing the generations come together.